Today at WWDC 2018, Apple gave us our first look at iOS 12. One of the key focuses of this latest update to Apple's mobile operating system is performance, and the company is bringing iOS 12 to more devices than any other previous version. Craig Federighi, Apple's senior vice president of software engineering, told developers that the update will help to speed up app load times. On the iPhone 6s, for instance, apps load up to 40 percent faster, and the camera loads up to 70 percent faster. iOS 12 will boost performance when necessary, but take the processor down a notch when it can in order to save battery. Federighi noted that while just 6 percent of Android handsets have the latest version of Google's mobile operating system installed, 81 percent of Apple users have iOS 11 -- and the wide range of supported devices for iOS 12 means this impressive statistic is likely to remain pretty much unchanged. So what else is new in iOS 12 apart from the focus on performance? Shortcuts for Siri can be used to get tips from Siri, and to create custom shortcuts for individual apps. A macro-style feature will enable users to use a single voice command to perform multiple actions -- such as pulling up directions for home, starting music and sending a text message all at once. Notifications are getting an overhaul, and it will be possible for them to be grouped to help reduce screen clutter. Do Not Disturb also sees the arrival of a number of new options including tweakable snooze times. 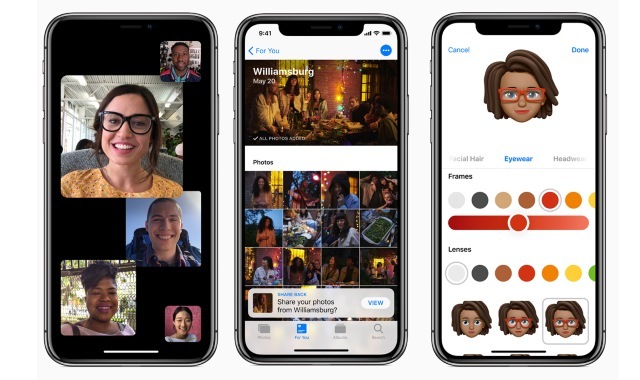 The Photos app has a new search function, and the camera benefits from new Animoji and personalized Memoji characters, as well as filters. Group FaceTime opens up a new world of group communication, and there are also updates to Apple Books and Apple News in the form of redesigns. CarPlay adds support for third-party navigation apps displayed right on the car's dash -- joining music, messaging, calling and automaker apps. The full list of devices that will get iOS 12 is coming to is as follows: iPhone 5S, iPhone SE, iPhone 6/6 Plus, iPhone 6S/6S Plus, iPhone 7/7 Plus, iPhone 8/8 Plus, iPhone X,iPad mini 2, iPad mini 3, iPad mini 4, iPad Air, iPad Air 2, iPad (2017), iPad (2018), iPad Pro (9.7, 10.5, and 12.9-inch models), and the 6th generation iPod touch. iOS 12 Beta 1 is available for developers -- or anyone else who is keen to take a look -- to download via the Apple Developer Program portal. A public beta starts later this month, and the final release of iOS 12 is scheduled for the fall.